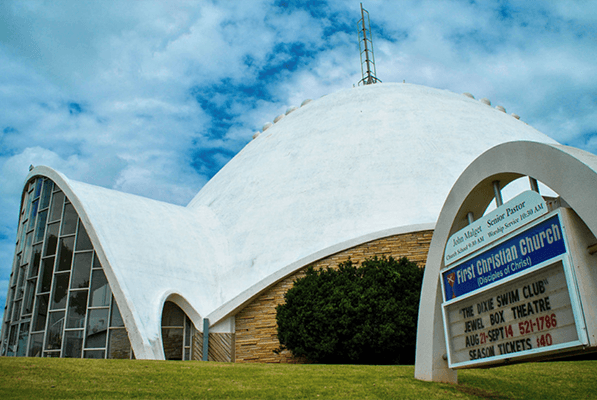 The First Christian Church in Oklahoma City is better known by its nicknames, “The Egg Church”, and “The Church of Tomorrow” for its iconic egg-shaped dome. But some worry that the egg may crack soon if a potential buyer decides to demolish it. The 1956 church looks like something out of the Jetsons. Its giant white, domed top makes the structure instantly recognizable. Its egg-like design has been praised by Newsweek and Life Magazine. The American Institute of Architecture, Central Oklahoma chapter, is one of the many voices asking the Oklahoma City city council to declare the site a historic landmark and give it more protected status. If that happens, demolition or change couldn’t happen for 180 days. News 9 reports that the church itself doesn’t want that to happen. They say it could reduce the pool of potential buyers and reduce property value. The congregation hopes another church will buy the property and keep the structure in tact. The city council in Oklahoma City delayed their decision about giving the church landmark status. They will vote April 9. This entry was posted in Architecture News. Bookmark the permalink.